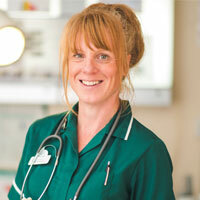 I am a veterinary nurse working at our Clevedon practice. I qualified in 1996 and over the years I have enjoyed working in various areas such as an out-of-hours’ emergency clinic, exotics, equine and farm, canine hydrotherapy and small animal practice. I have owned a variety of pets from dogs and horses to a chinchilla and tropical fish. Currently sharing my home is a cheeky miniature parrot (parrotlet) called Olive. I love caring for my pets and thoroughly enjoy being a veterinary nurse and extending that love and care to our clients' pets that are part of their family too. In my spare time I enjoy many activities such as running, cycling, swimming and climbing.